It's been a crazy few days here as Wednesday was the day my mum relocated from Wales. She starts her job tomorrow and should be into her new home very soon. For now though, we are having a great time together and the children are in their element while she is staying with us. With an extra pair of incredibly capable hands here I've been able to take it relatively easy and a fortnight after being taken into hospital, I'm starting to feel great. The friends who have seen me have remarked that I already (still swollen and bruised from the surgery to remove my gallbladder) look much better and seem to have more energy than in recent months. Hoorah! Apart from the arrival of our new house-mate, half term break has been fairly low-key with just a few trips out and about, and a lot of preparing Little Miss for her first morning at pre-school (yes, tomorrow is a big day around here!) 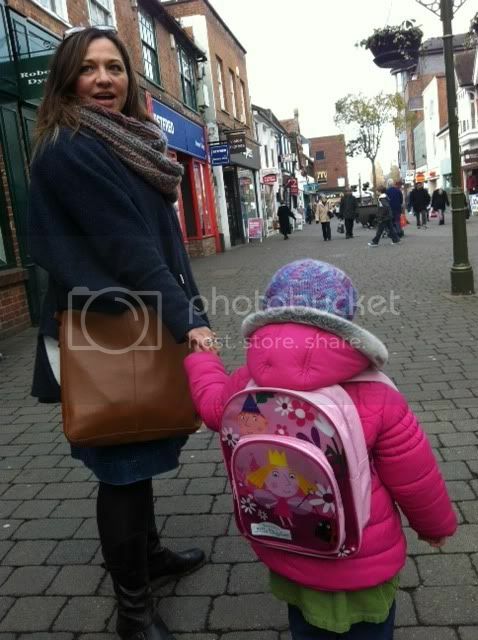 including a haircut, and a special outing to get her indoor "pumps" and a school bag. She is delighted with that and has hardly put it down since we got it. ... but did have to point out that late-30s isn't actually that young! My first trip out after 10 days! There has been A LOT of knitting. Having another knitter in the house is really nice - there's something very comfortable about sitting at either end of a sofa without needing to say much, just listening to the gentle clicking of my mother's needles. Little Miss has been joining in too.... in her own way. I've been crocheting more hair for Pixie Moon and will post some more pics when she's absolutely done - I think it's a considerable improvement on the single ball I used when she was made. Progress on the Hitchhiker scarf is also good (LOVE this pattern, beautiful knitterly-geometry, and I know that's not a word, but I don't know how else to say it) which I'm hoping to finish in time to wear to Unravel next weekend. Talking of Unravel, remember you have until tomorrow morning to enter the 1st part of the CFTC 1st Blogiversary Giveaway which is a ticket to Unravel courtesy of Nimu Yarns. All you have to do to be in with a chance is to comment on the giveaway post letting me know that you'd like to be entered - simple. I'll be back tomorrow to announce the lucky winner and there are lots more prizes to come over the next few weeks so keep a look out here, on facebook or on Twitter for details. I think (hope!) you're going to like them *grin* ENTRY IS NOW CLOSED. Look forward to meeting your Mum! 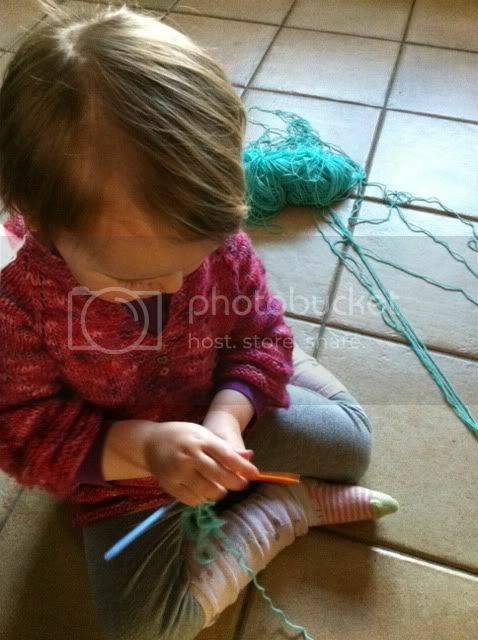 What an adorable young knitter photo! 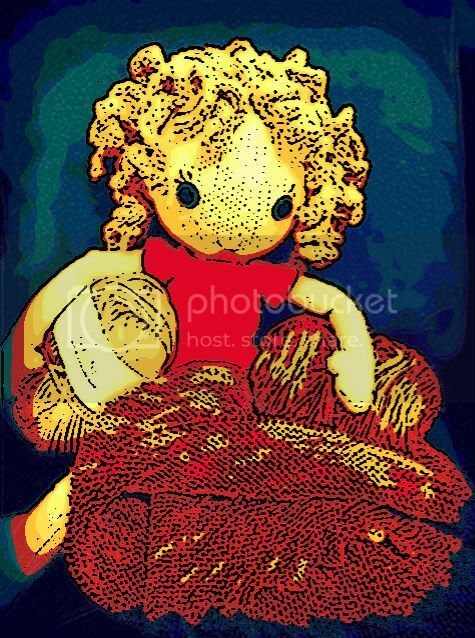 Thanks - she's getting a little frustrated that her "knitting" doesn't get quite the results she wants - but there's plenty of time as she's only 2! It must have felt lovely to get those compliments on the hats, and you are young!! It is very exciting see children grow up and getting them ready for new adventures! I just melted when I saw the picture of your little girl, so cute! Great to see you back on your feet :-).